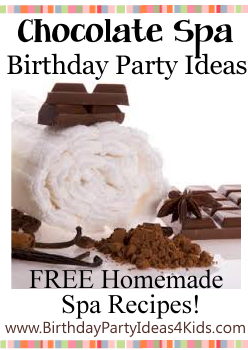 What could be more fun, or sweet, then a Chocolate Spa birthday party theme. The Chocolate Spa theme is great for children, tweens, and teen parties. Perfect for a Sweet 16 party too. Check the website for great homemade spa recipes to use for the Chocolate Spa party – there is even a great chocolate facial mask that works great! You don’t have to spend a lot to have a great party. Use these free ideas to make the party special and affordable. Birthday Party Ideas 4 Kids also has pages of free birthday games, party activities, icebreakers, scavenger hunts, mall scavenger hunts. sleepover ideas and more for birthday parties. What are your favorite things to do at a Spa party?